HARARE, Zimbabwe, July 31,2015 (ENS) – The American dentist who killed Cecil the lion was a “foreign poacher” who should be extradited to Zimbabwe to face justice, Environment Minister Oppah Muchinguri said today. In the Zimbabwe government’s first official comments since Cecil’s killing earlier this month, Muchinguri told reporters at a news conference that the Prosecutor General has started the process to have Walter Palmer, 55, of Minnesota, extradited from the United States. The two countries have a 1998 treaty under which the extradition could take place. The hearts of animal lovers and conservationists the world over have been touched by the killing of Cecil in Zimbabwe earlier this month. 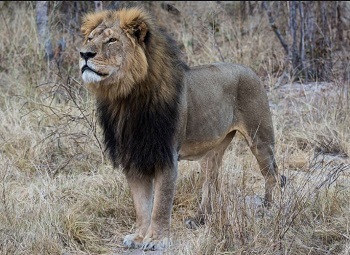 Well known to visiting tourists and researchers, the dominant male with a distinctive black mane, head of his pride, was lured with the carcass of a prey animal out of the safety of Hwange National Park. He was then shot with a cross-bow by Palmer who paid nearly $55,000 for the hunt and has admitted shooting the animal. Cecil did not die from that shot but escaped. Hunters tracked him for 40 hours and eventually shot him in the head with a gun. The lion’s head was severed from its body for a hunting trophy. In Zimbabwe, the illegal killing of a lion is punishable by a mandatory fine of $20,000 and up to 10 years in prison. Palmer has admitted killing the 13-year-old predator, who was fitted with a tracking collar as part of an Oxford University study. The American trophy hunter said in a statement Tuesday that he had professional guides and thought all necessary permits were in order. “In early July, I was in Zimbabwe on a bow hunting trip for big game. I hired several professional guides and they secured all proper permits. To my knowledge, everything about this trip was legal and properly handled and conducted,” Palmer stated. “I had no idea that the lion I took was a known, local favorite, was collared and part of a study until the end of the hunt. I relied on the expertise of my local professional guides to ensure a legal hunt,” he said. His dental office in Eden Prairie has been closed and Palmer has not been seen since his identity was revealed this week by Zimbabwean conservationists. The White House said Thursday it would review a public petition to have Palmer extradited that has attracted more than 100,000 signatures. American late night television show host Jimmy Kimmel broadcast an emotional monologue on Tuesday, urging viewers to donate to the Oxford University Wildlife Conservation Research Unit, which has tracked more than 200 lions in Hwange National Park for the past 20 years. In response to Kimmel’s appeal, at least 2,600 people donated a total more than US$155,000 to WildCRU. Macdonald said today that the donation total has swelled to £300,000 (US$469,000) overnight and that this morning American philanthropist Tom Kaplan and his wife Daphne contributed another US$100,000. But killing a lion pride’s dominant male like Cecil can have a wider effect. In an interview with CNN, Jeff Flocken of the nonprofit International Fund for Animal Welfaresaid that because Cecil can no longer protect his pride from rogue lions, other males, young cubs and females in that now unstable pride are placed in danger. As a result, Cecil’s killing could lead to the deaths of many African lions, a species listed as Vulnerable to extinction by the IUCN Red List of Threatened Species. Overall, the lion population is believed to have undergone a reduction of approximately 42 percent over the past 21 years – approximately three lion generations, 1993-2014, the Red List states. Yet the Red List says scientists have observed that sample lion subpopulations increased by 11 percent in four southern African countries, including Zimbabwe.